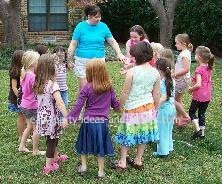 The kids circle games on this page all involve the kids gathering in a circle. These circle games are all classic kids party games. They are written so that all kids can participate at the same time. Read them over, pick which one will work best for the age of your party guests, and play! If possible, use the colors or theme of your party. Duck Duck Goose - Have children sit on the ground in a circle. One child is “It”. "It" goes around the outside of the circle, patting each child on the head and saying “duck” for each child. “It” will say “duck” over and over until unexpectantly saying “goose!” when giving a pat. The “goose” must then hop up and run around the circle while chasing “It”. If "It" makes his way back to the goose's seat before being tagged, he is safe, and the goose becomes "It". If not, “It” remains "It" for another round. Button Button Who’s Got the Button? - You’ll need a small object that can be hidden in the hands (either in your lap or behind your back), such as a button. Select one player to be “It”. “It” hides his eyes as the button is given to a child to hide in his hands behind his back. All other players put their hands behind their back as well. “It” uncovers his eyes and then has three chances to guess which child has the object. Adapt this game to your theme, such as using a flower shaped button for a “Flower, Flower, Who has the Flower?” game at a Flower Fairy Party. Cat and Mouse - Form a circle with everyone holding hands. Have one person be the mouse (who will be inside the circle) and one player be the cat (who is outside the circle). The cat then tries to catch the mouse. The players making the circle can let the mouse in and out of the circle to try to avoid the cat. If the mouse is caught, they become the cat and a new mouse is chosen. Chair Slide - This is sort of like classic circle games like musical chairs, but a great way for everyone to play, and no music required! Have chairs in a circle, one for each player except for the player who is "it". "It" stands in the center. "It" will say "Slide right", and everyone slides right. During this, "It" tries to sit in an empty seat. If he succeeds, the person who didn't slide fast enough becomes it. "It" should call out commands quickly to try to catch someone not moving the right way! Circle Tag - What would our circle games list be without a game called circle tag? Seriously! Have players for a circle, with one player being "it". "It" runs around the outside of the circle and tags a player. Both players then race around the outside of the circle in opposite directions, trying to get back to the empty space first. The player who gets there second will then be "it". Fruit Salad - Select someone to be "it" and then have everyone sit in chairs in a circle. "It" stands in the middle. Assign players, in random (but as equal as possible) order to be a fruit - apples, bananas or oranges. "It" will then call out the name of one of the fruits. All of the players who are that fruit have to jump up and find another seat while "it" tries to sit in an vacated seat before someone else gets there. The player that doesn't end up with a chair is the new "It". If he yells "fruit salad", the everyone must jump up and find a new seat! Human Knots - In this kids circle game, have 5 to 10 players stand in a circle. Each player places their hands in the center and takes hold of a hand of any two people. Then, everyone twists and turns to untie the "knot" they formed without letting go of each other's hands. Jack Sprat - Selection someone to be "it". Then, have everyone else divide into pairs and stand in a circle. When "it" says "face to face," the partners face each other. Other options are to say "back to back" or "side to side". If "it" says, "Jack Sprat", everyone (including "it") scrambles to try to find a new partner. The player who doesn't find a new partner will now be "it". 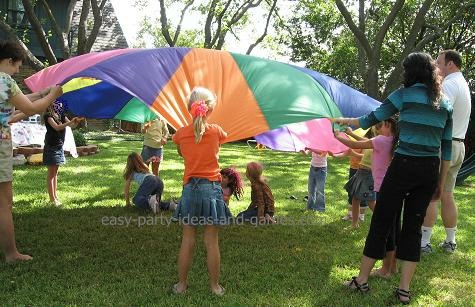 Parachute – If you like to hold parties at home, you may want to invest in one of the classic and favorite circle games of all time, a parachute. The kids love to bounce inflatable balls on top of parachutes and to make it go up and down. If you don’t have access to a parachute, then use a bed sheet! Ring Around the Rosie - Gather hands and play Ring Around the Rosie. Go round and around while saying “Ring Around the Rosie, a Pocket full of Posies, Ashes, Ashes, we all fall down!”, falling down at the end. After doing it once the normal way, try doing it really fast, in slow motion, really loud and on tiptoe. This is the grandaddy of all circle games, and has literally been around for centuries! Spiderweb - You'll need a ball of string (or yarn), and a group of players, 8 - 15 players or so would be a good range. Have players form a circle. Give one player the ball of string. They will yell out the name of another player and toss the ball of string to them (while holding onto the end of the string). The player who catches the ball of string then calls out the name of another player and tosses the string to her (while still holding on to a big of it themselves.) So, the string is passed on from one player to another in random order, while the player doing the passing keeps hold of some of the string. You'll end up with a giant spiderweb! Add your favorite circle games and kids party games to our list! After you have selected one of the circle games from our list, visit other kids party games pages to find other fun games for your kids birthday party.